comes to Greater New Haven with a new exhibit from the Greater New Haven Labor History Association. Winchester workers collect donations for disaster relief in undated photo. 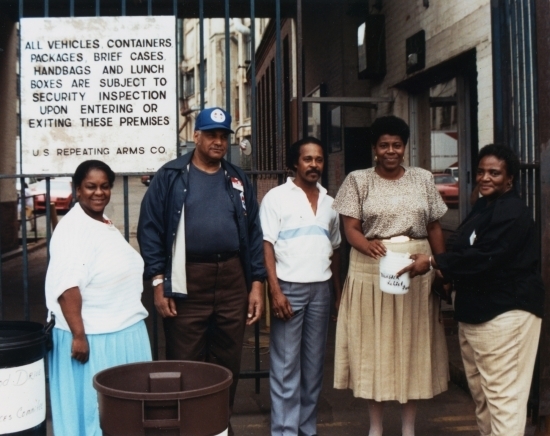 As one of New Haven’s most important employers in the latter half of the 20th century, the Winchester plant drew workers from across Greater New Haven and beyond, and had an enormous impact on the Newhallville community and the city of New Haven. During this time, the plant was a source of culture and entertainment for many workers, offering a variety of social outlets from the Winchester Club to bowling to musical performance. Later, with the introduction of Science Park, the community saw change and the eventual decline of accessible work opportunities, with the plant ultimately closing in 2006. The stories of Winchester’s workers and the impact of this important employer throughout the 20th and early 21st centuries have yet to be told. Calling All Former Winchester Workers! Did you work at the Olin Winchester plant in New Haven? Would you like to share some of your experiences? If so, please contact us sooner rather than later! If you have stories, photographs, artifacts or ideas to contribute, please contact Director Joan Cavanagh at joan@laborhistory.org or call (203) 777-2756 ext 2. The exhibit is based on oral histories, photographs and documents from the collection of the International Association of Machinists Local 609, which represented workers at the plant beginning in 1956, as well as donated images and personal recollections from those who were involved with the plant. Check back for up-to-date information about the progress of this exhibit.